Idk man but regardless, there’s a reason I’ve held onto these for 20 years. I’ve put these up against Heresy’s, RP-280f’s, KLF-30’s, Forte’s, Cornwall’s, and other high(er) end speakers and there’s just no comparison. I prefer these over everything I’ve heard so far. HOWEVER, I haven’t even been able to listen to my KP-456’s yet so I’m not sure what I’m working with yet with those. The story on these is that the lady has had them since given to her from someone high up at Klipsch. She used to live in Hope and babysat for someone that worked there and they gave these to her as a thank you for helping out. She said she knew the Klipsch’s and I think she said was taught French by Mrs Klipsch? I was trying to listen to her tell the story while I was setting them up for audition before I bought em so I missed part of the story. Pretty cool either way. Are these things solid birch? I’d like to sand them down and completely refinish to make them look new again. I had checked that section to find out more info but the weird thing is, it doesn’t reference this model, the H-WB. And the .pdf of the speaker shows the color options, but WB isn’t the initials for any of the color options listed. I’m always curious when I hear people say the Epics bass will thump you in the chest. Mine are now fed by a Bryston 8B-ST bridged at 400 watts (if memory serves for total watts). They’ve never sounded better but they definitely don’t thump, kick, or anything similar. All I get (which is great as far as I’m concerned) is fantastic clarity, imaging like no other, and great midrange. But no thump really at all. I didn’t think the 12’s in the cf-4’s were anything but really large midrange speakers. Does anyone’s cf-4’s really bang like this? I’ve had mine on many receivers over the years and never blown my skirt up. Trust me, I’ve tried! Did everyone gloss over the description that said they’re beryllium diaphragms? 😂 I almost bid but decided I can wait since I don’t even have my 402’s yet. Order of importance took precedent. But it would’ve been cool to have em and once I find the horns, I’d be good to go. Oh well. If shipping was an option, I would’ve grabbed em a year ago. I was waiting for that option to become avail. Damn! Running 4 speakers as stereo? Never thought of that option. I’ll have to see if any of them have the All Channel Stereo option. If they do then that would be my best bet. Interesting Emile. How do you connect 2 receivers together to play the same music source? Btw, a lot of the music I’d be playing would be through apps through Alexa or Chromecast. Hey, I’ve got 4 Klipsch speakers I’ll be running outdoors. One pair will be in the elements (ca-800t’s outdoor speakers) and the other pair will be protected from the elements with the exception of heat, humidity, and the cold (KI-172’s). I’ve got 3 receivers that I’ve kept over the years that aren’t being used but they’re surround sound receivers, for instance I’ve got an Integra DTR 7.2, Denon 3311ci, Harman Kardon HK3480, and an old 1996 Denon receiver that I can’t remember the model but I’m thinking a surround sound receiver may not be the best way to go. 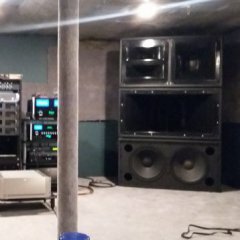 Anyway, what’s the best way to run 4 speakers at once playing the same music and not burn out the electronics or speakers? 4 channel amp with a pre? 4 ch integrated? Ideas? Suggestions? Thanks for your help. I’ll be starting to get it wired in the next week or 2 so I want everything ready to go.